I know that there seems to be a “day” for everything these days, but I’m pretty happy about this one! Today is National Oatmeal Day and we’re celebrating it with Aveeno. 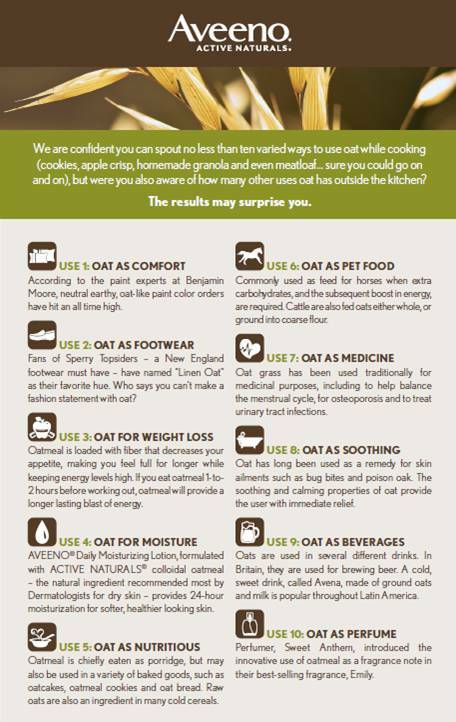 Oat is a leading ingredient in many Aveeno products, so this is a fun time to let everyone in on an awesome product! The Aveeno Daily Moisturizing Lotion is the #1 selling lotion in the U.S. and it’s #1 in my eyes, too. It’s shown to help your skin build a “moisture reserve” so your skin can replenish itself and not get too dry. The oatmeal in it helps protect your skin, soothes it and prevents it from getting dry. Aveeno is a great product to have handy while the weather is getting cooler and our skin is getting more dry. 2 Southern Savers readers will win Daily Moisturizing Lotion, Daily Moisturizing Body Wash, Skin Relief Lotion and Skin Relief Body Wash from Aveeno. Leave a comment below telling me your favorite use for oats. Winners for this giveaway will be chosen Monday, 11/5 and posted to the Giveaway Winners Page.